Is Money the "root of all evil"? What is Money anyway Where did the idea originate? What about interest rates and "paper gold? Where did the United States and the British Commonwealth get their fantastic wealth in the first place? Most important of all, what will happen to that wealth within your lifetime? What is the true source of wealth and what is YOUR best investment? Walk into a bank and your whole manner changes. An aura of awe makes people use hushed tones in the marbled mausoleums of Mighty Money! The building itself exudes an atmosphere of absolute confidence — if not the confidence of solid stone, brick, marble, polished thick oak, high-ceilinged basilicas of the old-fashioned banks, then it is the modern confidence of concrete, steel and glass with clinical and controlled luxury displayed in plush carpets, and pieces of modern art. As a customer you are treated with friendliness, warmth and sincerity — but always with a certain austere reserve, a certain understandable and fully expected distrust on the part of the money-holder toward the money-needer. It's something we take for granted. You have confidence that the bank is adequate to supply your need. You hope the bank will have enough confidence in you to risk supplying your need. You know certain securities will have to be produced to bolster the bank's confidence in your ability to repay — your land, your home, your life insurance, your auto, your ability as a wage earner...ALL will be freely open to scrutiny, and of course your past record of bill paying — your credit rating. It's not that debt is not respectable. Debt is demanded. It is a red ink society from the impossible national debt through ponderous corporate debt to individual insolvency. It's a society living on borrowed time spending money borrowed on time! It's hard — no, difficult if not near-impossible — to make ends meet, to live within your means. But that's all right. Nobody else can either. In fact since the early thirties, when the government decided it would be better to mortgage the future than to pay for the present, a climate was created in which it is uncomfortable NOT to be in debt! Nationally speaking that mortgage on the future is just about due to be paid — and when all the notes come due at once we're going to discover a fantastic and horrible truth: the richest nations on earth are bankrupt! But that comes later in this article: let's get back to you. Despite some misquote you may have heard from the Bible about money being the root of all evil, let's prove unequivocally at the outset that neither God nor His Word, the Bible, condemns money. There is nothing unholy or inherently evil in money or a bank! As with all things, God's principle is: it is not the thing which is evil, but what is done with the thing, the attitude toward the thing. What the Bible does say is, "For the love of money is the root of all evil..." (I Tim. 6:10). Even this is poorly translated in the King James Version and is better understood as rendered by J. B. Phillips — "For loving money leads to all kinds of evil, and some men in the struggle to be rich have lost their faith and caused themselves untold agonies of mind." No, God is not against money of itself. Abraham, the Father of the Faithful, the Friend of God (James 2:23), was a very rich man (Gen. 13:2) and was familiar with the use of money (Gen. 23). David, a man after God's own heart (Acts 13:22), during his lifetime gathered up tons of gold and silver, precious stones and costly jewels (I Chron. 29). Though there were many poor men God used in the history of this world, there were just as many, if not more, rich men in His service — if that surprises you, check your Bible and prove this truth! The paradox of the problem of riches is solved by the principle mentioned in the same sixth chapter of Timothy quoted above. Most of the chapter talks about how to be rich. It does not condemn the wealth itself. Again in the Phillips translation let's read a good summary of the principle beginning in verse 17, "Tell those who are rich in this present world not to be contemptuous of others, and not to rest the weight of their confidence on the transitory power of wealth but on the LIVING GOD, who generously gives us everything for our enjoyment." Remember that in the same example Jesus gave to the disciples to explain the difficulties a rich man would have in gaining the Kingdom of God, He also said that "with God ALL THINGS ARE POSSIBLE" (Matt. 19:23-26). For a more thorough explanation of this basic subject, for which we do not have room here, please read our reprint article entitled, "Does God Hate the Rich?" Money is mysterious to many. It's simple enough to see that if you have enough of it you can buy anything (almost) that you want. But what is money? Why do some people have more than others? Just how complicated is the system anyhow? What's the history of the mystery? As with nearly every major facet of our society — medicine, education, law, farming, government — banking finds its recorded beginnings in Babylon, inextricably entwined with religion because Priest-Kings ruled in ancient times. In an agricultural economy, barter was sufficient as a means of exchange. As men gathered themselves into cities and began to deal with one another in many capacities, they no longer raised flocks, herds and crops so they needed something to represent wealth. Something portable, precious, protectable. Gold and silver quickly came to represent, in certain weights, a given number of cows, sheep, donkeys, etc. Words you may be familiar with such as capital, capitalism, fee, rupee are all words which derive from cattle, or a cow-standard society. Many other forms of representation have been used — salt, feathers, dog's teeth, fishhooks. In today's modern world we may enjoy a laugh at someone who would think salt was money (are you worth your salt? ), until we would try to convince him that a column of figures in the electronic memory of our local bank's computer was what represented u w true wealth! As people gathered into cities and their horde of representative wealth (gold and silver) became larger, protecting it became a problem. Many a house had a secret chamber for the master's money — perhaps in a hole dug into the floor, perhaps a secret hiding place behind a tree, under a hedge, three feet deep in the earth of the little walled garden to the rear. At any rate, it was secreted in as safe a place as the master could think of — you can bank on that! Right, you guessed it! Look up the word in the big dictionary at the local library sometime. A bank is a mound or rise of earth! One basic meaning of the word is also "to cover" — you bank a fire by covering it with ashes so it won't all burn up while you sleep. Then when you want to start the fire in the morning you remove the covering (you make a withdrawal from your fire hank). Sometimes we become ashamed of the humble beginnings of our dignified institutions — why? These private banks (holes in the ground) were not as safe as desired. People didn't respect each other's private property, but being a superstitious lot they feared their many gods and wouldn't think of violating the temples. So, for a price, the local high priest would allow the storage of the representative wealth (money) in his temple treasury to insure its "safety." In fact, the very word "money" derives from the Latin and comes from the Roman mythology that Juno invented money. The truth of the matter is that both Juno, with his panoply of gods and goddesses, mid the invention of money came from Babylon! The Romans continued the temple-money practice in the temple of Juno MONETA: so what was coined became called "money" and the place where it was coined was called the "mint"! As the gold or other representative wealth began to accumulate in the private coffers and under the protective custody of the high priest in the temple, the Priest-King (let's call him Baal Minrud, Rude for short) put together an interesting plan (about 2200 B.C. ), He noticed that at no one time did everyone call for the wealth sequestered in the safety of the temple vaults. He also noticed that intelligent and capable men who had REAL property (land, cattle, houses, slaves) often lacked the cold gold to finance a venture t1i;it would turn them from middle class into rich men. Putting these two factors together he became a hanker. He called the men aside (those whom he had first checked out to be sure of their securities) and told them the deal he had in mind for them. If they would pledge their property in lieu of the repayment of the gold he would lend them (should their venture fail), Rude would finance their plans. Rude arbitrarily picked thirty percent as the yearly amount of interest that should be paid to him for the use of the gold. The first farmer took the gold from Rude. After pledging his property in lieu of repayment at the stipulated terms, lie took the gold to a local businessman contracting to have an irrigation system built and enough seed supplied to plant a crop. That local businessman took the gold to the temple for safekeeping. Rude then offered the same chunk of gold on the same terms to another farmer who wanted a house built. The builder brought the gold to temple for safekeeping! Rude then offered the same piece of gold to a local merchant, on the same terms, so he could pick up enough camels to form a caravan to Egypt. The camel dealer brought the gold bar to the temple and deposited it in the safety of the sanctuary. By this time Rude added another idea to his plan. Since the gold was heavy, cumbersome to carry, even dangerous to transport — Rude convinced his next customer (sticking to the same terms for the loan) that it would be safer for all concerned if he just issued a clay tablet receipt for the amount of worth that the gold represented. The clay was easier to carry. It bore the imprint of the high priest's own signet ring and would be accepted ns if it were gold by all local businessmen. So Rude's convinced customer took his clay (which represented gold, which represented wealth) receipt to the boat builder and had ten barges built. The boat builder accepted the receipt, gave it to a lumber supplier and in addition went to Rude and requested a loan, for expansion of his operation, of an equal amount (also indicated by a clay tablet receipt) and put his business in hock for security. To make a long story short, Bad Minrud found that within the year he Was able to lend the same bar of gold TEN TIMES. Let's say it was a ten-pound bar. At the end of the year Rude was still in possession of the original gold bar itself. In addition he owned one farm and a half interest in a caravansary (two of his debtors didn't make it). In addition to that he had been paid eighty pounds of gold by the eight debtors who succeeded with the help of the loan, plus of course the twenty-four pounds of gold in interest. Rude's ten pounds had gained him one hundred four — not bad! Of course the original ten-pound bar was not really his — it was only left there for "safekeeping" by a merchant from Ur, but he hadn't called for it in the course of the year. And if the merchant ever did call for his bar, Rude figured he could talk him into taking a clay tablet receipt for it, leaving the actual bar in safekeeping (?) in the temple! The ten ten-pound bars (plus, a little) that Rude now actually owned, were not worth just ten times the original bar he had speculated with — to Rude they were worth much more! He had already learned by observation that only about one out of ten of the people who had money in the temple for safekeeping ever actually requested to have their gold back at any one time. This meant he could use nine tenths of other people's money at any one time any way he wanted. And now that the idea of accepting clay receipts was catching on, there was no way to tell how far he could bluff his way. As long as the people had confidence in the clay receipts, he could continue to amass great wealth at very little actual risk or expenditure. Rude even got himself into thinking he was performing a real public service in the process of gathering all the real wealth of the people into his own coffers. There were more jobs. Every type of shop and industry had been given a shot in the arm. There was bustling activity everywhere. Rude began to see that he could control the entire economy. If his system began to destroy itself because people couldn't any longer sustain the exorbitant interest rate of 30%, he could postpone the ultimate day of reckoning by lowering the rate, say to 20%! Baal Minrud realized, of course, that sooner or later the ultimate would happen. The economy would collapse. In order to pay their debts the society as a whole would become sellers, and there would unfortunately be no buyers. They would storm the temple in angry protest when the word leaked out that the clay receipts couldn't be redeemed for gold, that they weren't worth the mud they were written on. The people would lose their confidence, their faith in him (or his sons or grandsons), in the clay money, in the temple. But if he exercised just a little caution he could make it work during his lifetime — and that is what counted to him! History shows plainly what did happen. Not just to Minrud's economy, but to all those who followed in his footsteps. Usually the economy collapsed in 100 to 150 years. The economy slipped from gold-backed to silver-backed to copper-backed to lead-backed money. In each case, whatever metal was the backing was hoarded until there was not enough of it available to conduct the economy (tight money). So a cheaper, more available metal or medium of exchange (easy money) would be substituted, etc, etc. until ultimate collapse. Babylon went this way. Assyria, the Greeks in their time, and the Romans all trod the same road. Numberless other economies: ditto. The key to the downfall was the exorbitant (though exhilarating at the time it was initiated) interest rate. According to the Federal Reserve Bank, "Money is the confidence people have that they will be able to exchange such money for real goods and services whenever they choose to do so." This is why money becomes a god to many people — money becomes that in which they have their trust, their confidence, their FAITH. It's really very simple: Money is confidence. Money is what people mutually agree it is at a given time. If they all agree that it is gold, then money is gold! Gold is certainly the dominant money idol in the pages of history. Many is the man, or whole society of men, who has striven greedily and died for the sake of gold.' But the gold is not to blame! Just as much suffering has gone on in the process of the greedy getting of stones and bones, silver and lead. It doesn't make much difference whether you call it Federal Reserve Note or Rusty Nails (which have been used for exchange purposes) — whether you term it Special Drawing Rights (the "paper gold" based on nothing currently being used to settle international debts) or whether you agreed to settle for Elephant Tails as they readily did in the past in Portuguese West Africa. AS LONG AS THE PEOPLE YOU DO BUSINESS WITH AGREE TO ACCEPT YOUR "MONEY" IT DOESN'T MATTER WHAT IT IS. AND EQUALLY IMPORTANT, WHEN THE PEOPLE YOU TRADE WITH NO LONGER HAVE CONFIDENCE IN YOUR MEDIUM OF EXCHANGE, YOU CAN BECOME A "RICH" BANKRUPT! There are two schools of thought at the extremes of money thinking. One feels that only a solid (which word comes from a Latin coin, Solidus) gold-backed monetary system can bring stability to the financial world. Their confidence is in Gold. At the other pole of thought is the thesis upon which the Western World has its confidence — the productive capacity of society itself. This school has been followed diligently since the early thirties. A fellow by the name of Keynes (pronounced Cain's) put this theory into words in an essay entitled Auri Saera Fames: "Almost throughout the world, gold has been withdrawn from circulation. It no longer passes from hand to hand, and the touch of the metal has been taken away from men's greedy palms. The little household gods, who dwelt in purses and stockings and tin boxes have been swallowed up by a single golden image in each country, which lives underground and is not seen. Gold is out of sight — gone back into the soil. But when gods are no longer seen in a yellow panoply walking the earth, we begin to rationalize them; and it is not long before there is nothing left." While succinctly pointing out the fallacy of trusting in and worshipping gold as the money god of the past, Keynes didn't seem to realize that he was substituting a new god for the old god! And so today's money worshippers bow down before the image of nothing, whereas their opposites bow down to the image of gold! Since the Keynesian theory is what we are living under, let's examine it briefly, a little more thoroughly. Perhaps the key is provided by the highly respected international advisor on finances, Dr. Harry Schultz. 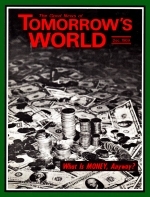 In his circular letter of October 30, 1969 he states, "Once man introduced money he introduced speculation." In other words, while man remained on a barter system, speculation was nearly impossible. If you had ten head of cattle, you had ten head of cattle, and there was no way to make that ten head of cattle appear to be a hundred head! But a piece of metal was substituted as a representation of the real wealth. A piece of metal was acknowledged as being worth so many head of cattle. Speculators could then "play the market" with the metal, since the decision as to how many head of cattle it was worth was arbitrary and decided by men in common agreement. Men could agree at a different worth for it at one time than at another: THIS IS SPECULATION. At each stage of the money game you get further away from a total grasp of real wealth. "It becomes more and more abstract, until it reaches the highly sophisticated form of our money, which consists primarily of numbers on the ledgers of the banks that maintain our checking accounts. Although we still use some currency (worth, in reality, no more than the paper it is printed on) and some coins, most of the money we spend moves from buyer to seller through the checks that order the banks to debit one account on their books and to credit another. Thus most of our money has no real value and no tangible existence: "We can't see it or feel it or smell it. This is one of the reasons why its quantity is so difficult to regulate" (A Primer on Money, Banking, and Gold, by Peter L. Bernstein). The crude manipulations that Baal Nimrod went through to augment his wealth are multiplied in the many devious and mysterious imaginations of a modern market which has many diversified representations of true wealth: coin, currency, gold in Ft. Knox and the Federal Reserve vaults in New York, demand deposits which back up our checking accounts, time deposits which exist only as figures on a ledger, bonds, stocks, mortgage papers, charge accounts, ad infinitum. So we find ourselves in a rather ludicrous situation. If you have any money in your pocket, please take it out and take a look at it. Since American currency is the hinge of international financing, let's see what it says on the American money. On the top of one side of the paper money you will notice that it says, "Federal Reserve Note." I am now looking at the face of what we call a five-dollar bill. It also says, "This note is legal tender for all debts, public and private." "The trick in the Federal Reserve Notes is that the Federal Reserve Banks lose no cash when they pay out this currency to the member banks. Federal Reserve Notes are not redeemable in anything except what the government calls 'legal tender' — that is, money that a creditor must be willing to accept from a debtor in payment of sums owed him. But since all Federal Reserve Notes are themselves declared by law to be legal money, they are really redeemable only in themselves! To put it briefly, they are an irredeemable obligation issued by the Federal Reserve Banks" (A Primer on Money, Banking, and Gold). A few more quotes from this basic book will help us understand the money we use a little better. "In short, the money we use every day, the money that we are all happy to accept in payment for goods sold, services rendered, and debt: incurred, is intrinsically worthless. It has no tangible backing, in the strict sense of the word" (p. 105). "When we look back over the ground that we have covered and ask what the American dollar is really based upon, we would have to say that it exists essentially on promises and bookkeeping machines" (p. 107). "These trends have had another curious corollary. Whereas the public has been feeling more liquid, the banks have actually been moving into an increasingly illiquid condition.... This partially reflects sufficient confidence on the part of the bank officers that the American economy is now so stable that wholesale withdrawals of cash from the banking system, as happened in the 1930's, are highly unlikely. But it also reflects the belief of bankers that most of the money in time deposits will stay there instead of moving into demand deposits where the odds are much greater that it will soon be withdrawn.... Of course, none of these trends need lead to difficulty so long as current patterns prevail. They suggest, however, that a reversal of current patterns, prompted, perhaps, by rising demand for money occasioned by an inflationary cycle, could ultimately came a monetary crisis as intense as anything witnessed in our earlier history" (p. 154). "To return to the point from which we have started: Money and gold have no use or value in themselves. On the contrary, their value derives only from what we can buy with them. "In short, our wealth lies neither in the vaults at Ft. Knox nor on the ledgers of our banks. Rather, it lies all around us, in what we have so prodigiously produced in the past and what we are capable of producing in the future" (p. 166). On the other side of this five-dollar bill I have in my hand it says, "IN GOD WE TRUST." It is through a great deal of controversy that this statement has remained on our money. But what does this mean? I'm afraid it doesn't mean much more than the hollow circular reasoning behind the expression "Federal Reserve Note." In fact, when you understand what money is, it seems that there must have been a typographical error in the printing of this currency and it should read, "IN THIS GOD WE TRUST." Surely you have heard the expression, "THE ALMIGHTY DOLLAR! " Because we do literally trust in that physical piece of paper to bring us our needs — to supply us with goods and services of our choice at the time of our choice. Our trust is in the money itself and in what stands behind the money — the economy of the nation. There is a deeper hypocrisy in bringing God into the picture than might be supposed. Let's read that verse from the Phillips translation mentioned earlier in this article again, "Tell those who are rich in this present world not to be contemptuous of others, and NOT to rest the weight of their confidence on the transitory power of wealth but on the LIVING GOD, who generously gives us everything for our enjoyment" (I Tim. 6:17). God's message clearly throughout the Bible is that we should put our trust in Him, not in princes or governments or land or money or people or institutions, but in Him! This does not mean that the land and the resources on that land and the money and everything else that is freely given to us from God is evil of itself or should not be used freely; but that in the use of it we should always maintain our ultimate trust and faith and confidence in God and not in any of these things! It's all too easy to focus on the physical. Let's understand where the wealth comes from in the first place — the real wealth! The Eternal God is the Possessor of the heavens and the earth as well as being its Creator. It is He that made the earth habitable for mankind in the first place. It is that great God who put the abundance of wealth into the earth for man to dig it out. It was a loving Creator that covered the millions of square miles of the surface of this globe with riches beyond imagining in the natural resources we not only take for granted, but greedily destroy beyond measure as we use them. That same great God made a covenant with a man called Abraham and promised that man that if he would serve Him unswervingly, if he would put his absolute and total and complete trust and confidence in the living God, no matter what, that He in turn would share as a co-owner with Abraham this entire earth and indeed even the entire universe! That promise to Abraham also contained a temporary and physical fulfillment for his descendants. Abraham's descendants were to possess the gates of their enemies and live in the rich and fat places of the earth in comparison with the other nations. Contrary to popular belief, ancient Israel did not receive those promises from God, but because of a constant rebellion against Him had the ultimate fulfillment of those promises postponed for 2520 years. Scattered in total captivity over the broad face of the earth, the many tribes of ancient Israel settled down in new lands. They lost their identity as Israel! They forgot who their God was! Still they received the physical part of the unconditional promise that God had given to Abraham. Since about 1800 the chief beneficiaries of the birthright promise that God made to Abraham have been the modern-day descendants of Ephraim and Manasseh. These modern nations of Ephraim and Manasseh do not realize that it was God who gave them their great wealth because they do not even know who they are, much less recognize that the God of Abraham, Isaac and Jacob is their ancestral God as well as their Creator God! Is Israel All of Israel? The tiny nation of Israel today by no means represents more than a very small portion of the modern descendents of Israel. Before all Israel was taken into captivity anciently, it split up by civil war into two nations: Israel and Judah. Those people who live in the Israel of today are descended from a portion of those who came down through history maintaining their identity as the house of Judah. The vast majority of the ancient Israelites in the Ten-Tribed Nation called Israel in that day, rejected their God and rebelled against Him to such an extent that in their captivity they lost not only a knowledge of that God and the promise that He had made to their ancestor Abraham, but they even forgot that Abraham was their ancestor! They forgot that they were Israel! History swallowed them up about 700 years before Christ, and it wasn't until the first years of the 1800's after Christ that the unconditional promises that God gave to Abraham began to be fulfilled in the magnificent splendor of the riches that the God who made the earth gave to the tribes of Ephraim and Manasseh — the British Commonwealth Nations and the United States of America. In Which God Do We Trust! So the great God who gave all the wealth is rather upset when He sees Himself denied by that wealth and yet sees His name mockingly printed on the nation's money! In Hosea that God says, "Little she knew it was I who had given her the grain and oil and wine, who had heaped on her silver and gold [they devoted it to Baal]. So now I recall my grain in its season, my wine in its month; I reclaim my wool and my flax, that went to cover her nakedness; and I leave her all bare to the eyes of her lovers [international allies and trading partners)" (Hosea 2:8-10, Muffatt translation). Speaking to the end-time nations of America and Britain, Isaiah prophesies, "Their land also is full of silver and gold, neither is there any end of their treasures; their land is also full of horses, neither is there any end of their chariots [that is, automobiles and mobile weapons of war in modern language]: Their land also is full of idols; they worship the work of their own hands, that which their own fingers have made [they trust and have confidence in their own ability to produce a prodigious economy]" (Isaiah 2:7, 8). Even if you do not agree that these great nations today are indeed end-time descendants of Abraham, you must agree that, since these two great nations came to affluence, they have steadily departed from even a semblance of Godliness. That they have been absorbed in their own affluence. That they worship their own economies and forms of government. That they are hell-bent on a toboggan slide to the depths of immorality. That they have trust and faith and confidence in what their economies can produce and not in the God who gave them the resources from His earth to produce those manufactured goods. That the mocking statement, "In God we trust," is printed blasphemy! That same God of Abraham, Isaac and Jacob, disowned and unrecognized by His modern peoples, is right now in the process of taking away the great wealth that He gave to us — because of our blatant and total rebellion. Actually the main way God takes these things away from us is merely by letting the natural laws He set in motion take their toll. To permit the greedy nature which has led us into the economic chaos in which we live destroy us. To allow us to fall into the pits we have dug for ourselves. God is going to allow us to fall into TOTAL COLLAPSE in the near future. A collapse in every sense of the word - and a final, actual PHYSICAL CAPTIVITY! A financial collapse, a moral collapse, a collapse in the health and even the daily sustenance of food on our plates, a collapse of our great cities in nuclear holocaust, a total collapse of the entire nation and economy in which we trust and have our confidence — that which our money is based upon — our god: our manufacturing capacity! Not until the remaining few left alive, who are in captivity, come to see their mistake and recognize who their God is, will He intervene and restore to them, not only the riches they had before but those far beyond our ken in the Wonderful World Tomorrow. At that moment when the great God of heaven and earth decides to intervene in mankind's affairs, and particularly in the affairs of the descendants of His friend Abraham, people will begin to recognize that there is only one source of true confidence, one secure hope for eternal prosperity: God Himself! God is returning to take over the governments of this world, to establish the economy of the World Tomorrow, to put down all war and see to it that people do not learn to make war anymore. The Creator God is coming to restore This polluted planet to its intended beauty by teaching man how to use the great blessings He gives. All men everywhere are going to discover that whatever they trusted in before, whatever they had confidence in before is no longer of any worth or any value. Everyone will discover that of his own hand, of what he can manufacture or make, of a gold or silver or paper representation of wealth — that he cannot even supply the simple necessities of food, clothing and shelter for himself but must in all things rely on God. Make no mistake. There will be a great rise in world trade even after the destruction of the nations of the British Commonwealth and of America. Trade and industry will be surging and burgeoning just as it was in ancient Babylon under Baal Nimrod. Along with all her other monstrous debts, public and private, the United States of America has a debt to its Creator God! This year alone that debt amounts to a figure in excess of SIXTY BILLION DOLLARS! "How can that be?" you say. That can be, because that figure is roughly one tenth or ten percent of our gross national income for this year. One tenth of that which we worship as a god instead of giving it to God. "Will a man rob God? Yet ye have robbed me. But ye say, wherein have we robbed thee? In tithes and offerings. Ye are cursed with a curse: for ye have robbed me, even this WHOLE NATION!" (Mal. 3:8, 9.) Yes, this entire nation, forgetting its God, not knowing its own true identity, wandering Godless in a Godless world, refuses to recognize its debt to its Creator. This nation spends on its defense alone, an amount billions greater than its tithe would be! It trusts in its manufacturing ability and armies to preserve it in the face of enemies, it trusts in its economy to sustain it financially. It trusts in its technological know-how to continue to produce a giant volume of goods from the good earth — rather than trusting in the Creator of the good earth! Let's notice just briefly, in contrast to the world's way of doing business, what God's way of doing business is. Instead of God loaning us some hard piece of metal which we would agree with Him represents wealth, God gives us the earth! Out of that earth by His generous laws, sustained by His might every second, come the untold riches God designed to be ours in the first place: that is ONE HUNDRED percent of everything we have! Instead of requiring us to pay back that 100 percent to Him every year plus 30 percent, or 20, or any other figure we might pick (from where we would get that percent I don't know! ), God gives us the full 100 percent and requests that we return to Him ten percent! But He tells us that if we have our faith and trust and confidence in Him, then we will return to Him that which is His anyway. But He only requires one tenth of all He has given us freely in the first place! If we put our trust in Him rather than in the manufactured goods or the cold metal that comes from the earth, then His promise is that He will pour us out such a blessing that there will not be room to receive it! That the crops of the next years will exceed those of the years before. That our health, our well-being, our safety, will he insured — THIS PROMISE APPLIES TO EVERY INDIVIDUAL AS WELL AS TO EVERY NATION! (See Mal. 3:8-12.) For further information about that vital tenth, read our free booklet, Ending Your Financial Worries. As you well know, happiness, cannot he purchased with money. True love cannot be purchased with money. Health cannot be purchased with money. Safety from our many enemies cannot be purchased with money and certainly ETERNAL LIFE cannot be purchased with money! Salvation, forgiveness of sin, SONSHIP in the Kingdom of God cannot be purchased with money. Let's notice an unusual statement made by God in the book of Isaiah — "For thus saith the Lord, ye have sold yourselves for nought; and ye shall be redeemed without money" (Isa. 52:3). To think that very soon, the Great God who made everything is going to set His hand to SAVE THE WORLD! To think that God is not going to require payment of any kind but, gives all freely all those things which cannot be purchased is good news! The purpose of this Work is to see that as many people as possible realize that the time of God's intervention is at hand. That it is time for all of us to check our securities, to examine our true wealth, to find out what it is we have our faith in and how confident we are in the true and everlasting values of good character as described by our Maker! And so as it goes on to say in verse 7 of this same chapter in Isaiah, "How beautiful upon the mountains are the feet of him that bringeth good tidings, that publisheth peace; that bringeth good tidings of good, that publisheth salvation; that saith unto Zion, 'Thy God reigneth!' The watchman shall lift up the voice; with the voice together shall they sing: for they shall see eye to eye, when the Lord shall bring again Zion" (verses 7 — 8). No, money of itself is not evil — it is how we think about it or what we do with it that is either evil or good. So those of us who know and believe this truth from the innermost part of our beings have put our confidence and faith and trust in God and His promises. To prove this in every way we endeavor and strive to do what God says, whether it is with our time, our effort and energy, or our money. Jesus Christ put it very aptly in the New Testament where He said, "Where your treasure is, there will your heart be also" (Matt. 6:21). If we trust in money, whatever its substance, to solve our problems, give us health, protect us, heal and help us, then we have our trust in money and we are worshippers of that god called Mammon about which the Creator God has a great deal to say. He uses many analogies regarding money, such as the parable of the talents, which shows that we should use everything that we have been given by God to serve Him and to increase — with the power of His Spirit and according to His laws — those gifts that He has given to each and every one of us (Matt. 25: 14-30). He warns us very sternly not to put our trust and confidence in physical representations of wealth that we have laid up where "moth and rust" — and He might well have added "inflation and collapse of an economy" — corrupt, but to make for ourselves treasure in heaven (Matt. 6:19, 20). That is not just an ecclesiastical phrase. It is not just a gimmick to get the clergy supported. It is a statement from your Savior endeavoring to get across the important point that your total trust, your ABSOLUTE CONFIDENCE, must be in God who made all things and not in any physical representation of wealth dictated and stipulated by your fellow mankind — that you do not trust in things but in the CREATOR of all things! Our Creator goes on to command of us that we be good stewards of the physical things that we find in our hands (Luke 16:1-13). That is, that we use the money, the property, the abundance that comes from the soil to serve and to worship God and NOT to worship that abundance itself as a god. God wants us to be business partners of His. We establish that partnership, we prove our trust and faith in Him by returning to Him one tenth of what He gives to us. A very simple token and a small one, as physical and monetary proof of our belief. Those of us who have so dedicated our hearts and treasures in complete trust and confidence into the hand of Almighty God will come with confidence to that place in human history when all the economies of all nations dissolve into nothingness. At that time the great treasure which God has in heaven will be brought with Him from heaven to this earth and given freely, abundantly, overflowingly in the currency of true wealth — in the sharing and possessing of the heavens and the earth as a SON OF GOD! Truth should be given freely. "Freely ye have received, freely give" (Matt. 10:8). Let's see some inspiring things that God has to say about the spiritual truth of the purpose of life and the reason for His creation of mankind — "Ho, every one that thirsteth, come ye to the waters, and he that hath no money; come ye, buy, and eat; yea, come, buy wine and milk without money and without price. Wherefore do ye spend money for that which is not bread? and your labour for that which satisfieth not? hearken diligently unto me, and eat ye that which is good, and let your soul delight itself in fatness. Incline your ear, and come unto me: hear, and your soul shall live; and I will make an everlasting covenant with you, even the sure mercies of David" (Isa. 55:1-3). This is talking about that soon-coming time when God will be ruling this earth. The Good News of Tomorrow's World! It does not mean that money or gold or banks will not be used. It means that the trust and faith and confidence will he in God and NOT in things. In so warning us ahead of time, God urges us to recognize what our true source of wealth is and so He says, "Seek ye the Lord while he may be found, call ye upon him while he is near: Let the wicked forsake his way, and the unrighteous man his thoughts: and let him return unto the Lord, and he will have mercy upon him; and to our God, for he will abundantly pardon. For my thoughts are not your thoughts, neither are your ways my ways, saith the Lord. For as the heavens are higher than the earth, so are my ways higher than your ways, and my thoughts than your thoughts" (Isaiah 55:6-9). Make your investment an eternal investment. Make God your Partner! Put your heart into the Work that God is doing in this end age — the Work of warning the world of the immediately impending troubles soon to come — the Work that is publishing the message of the Good News of Tomorrow's World — a world at last at peace living under the loving auspices of our Creator God. Let this verse be a prophecy in God's Word concerning YOU — "How beautiful upon the mountains are the feet of him that bringeth good tidings, that publisheth peace; that bringeth good tidings of good, that publisheth salvation; that saith unto Zion, Thy God reigneth! Thy watchmen shall lift up the voice; with the voice together shall they sing: for they shall see eye to eye, when the Lord shall bring again Zion" (Isa. 52:7-8).